Store in cool and dry place, keep away from direct sunlight. 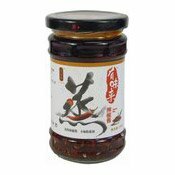 Ingredients: Vegetable Oil, Soy Sauce (Contain Caramel), Chilli, Salt, Sesame, Ginger, Garlic, Shallot, Soybean Powder, Sugar, Chinese Prickly Ash, Food Additives (Flavour Enhancer E621, E635), Preservatives (E202). Simply enter your details below and we will send you an e-mail when “Hot Chilli Pepper Sauce (有味來辣椒醬)” is back in stock!